Here is an artist who really wanted to stick to his dreams , born in Brittany, nothing predestined him to become a circus artist except for his unfailing passion for this magnificent trade. He continued believing in his dreams and at the end of his studies, he put all his energy in the mastering of the arts of the circus ring. Introduced him for the first time when he was only 14years old and was practicing juggling ; since then he has specialised into aerial disciplins and... what a road he has travelled since then! 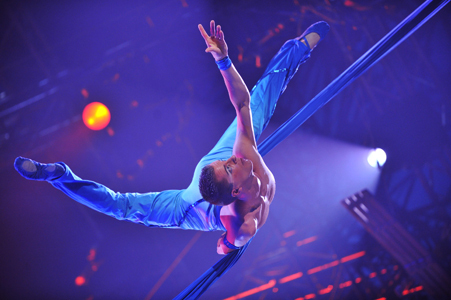 Rewarded at the world festival of 'cirque de demain', at the international festival of circus in Massy, also the one in Bayeux and at the international festival of circus of Monte-Carlo, in spreading his wings, he tunes his words in: masculine grace, strength and elegance. Silence, an angel is passing by.